OUTBOUND E-newsletter: Simplified & Easy Mobile Browsing: Multipak Website Now Mobile! 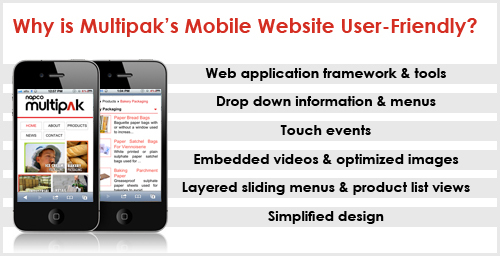 Simplified & Easy Mobile Browsing: Multipak Website Now Mobile! Multipak’s new mobile website implements tools to enhance mobile experience, browsing, information gathering and communication. With technological advancements in the mobile phone industry accompanied by round-the-clock internet connection, a large mass of the world population is online 24/7 through smart phones and other mobile devices. Multipak’s new mobile website adapts to smart phones, integrating the latest micro-browsing technology to offer visitors the speed and easy functionality capabilities of a web app. What Information does Multipak Mobile Website Offer? Multipak mobile site provides in-depth product information and allows visitors to request for quotations directly from mobile devices. When visiting a specific product page, the website suggests related products to facilitate navigation and help find other products of interest. Visitors can download Multipak’s Corporate Fact Sheet and Export Sales Map, as well as read more 'About' the flexible paper packaging manufacturer. The site links to the corporate newsletter, OUTBOUND, and displays Multipak’s certifications, including PEFC, FSC, BRC, HACCP. Established in 1997, Multipak manufactures specialty paper bags (handle bags, self-opening sack SOS bags and satchel bags), paper rolls, paper sheets, gift wrap, and paper core. Multipak’s paper products range from commercial to high-quality grades. All products may be coated with select materials and may be printed in up to 8 colors. The paper converter serves Saudi Arabia, Gulf Corporation Council (GCC), and North Africa markets. Multipak produces and supplies ice cream cone sleeves, as well as ice lolly push-up packaging to Australia, Europe, the Far East, Middle East and North Africa (MENA), and North America.